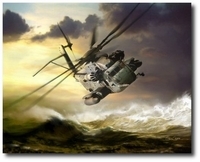 Aviation Artist Chris Cosner began his career and love for aviation with an enlistment in the U.S. Army. With the U.S. Army's 25th Infantry Division Chris was a crew chief on a UH-1H "Huey" helicopter. He racked up hundreds of flight hours serving in such theatres as Thailand and the Philippines. After the Army he continued his service with the West Virginia National Guard while working full time for Pratt & Whitney Aircraft Engines. It was during this time he began studying with other aviation artists and fostering his love for art. Enlisting in the U.S. Army Reserve's 6th Calvary Regiment led Chris to the world's best attack helicopter, the AH-64 "Apache" and a career with Dyncorp Aerospace. Working with Dyncorp gave him the opportunity to work with numerous platforms including the UH-60 "Blackhawk", OH-58 "Kiowa", the Marine Corp AH-1W "Super Cobra" and UH-1N "Twin Huey" and the Navy TH-57 "Sea Ranger". Chris later transferred to the U.S. Naval Test Pilot School maintaining U.S. Army C-12s where he earned the Commander’s Award for Safety Professionalism. Working at the test pilot school gave Chris the opportunity to interface with some of the finest pilots in the world and fuel his love for aviation and passion for aviation art. Chris is a Life Member of the Disabled American Veterans Association. He recently completed his Bachelor’s Degree in Art and lives with his wife and two daughters in the beautiful hills of West Virginia. Chris continues to serve his country by providing consulting and graphics for interactive computer based training applications for the military, helping to better train our troops. He continues to paint in his free time and looks forward to several new releases in the near future.